Ever since I can remember I’ve always loved comics books – which is what led me to become a maker of the funny books. The truth is though that everybody loves comics and has a soft place in their heart for them. 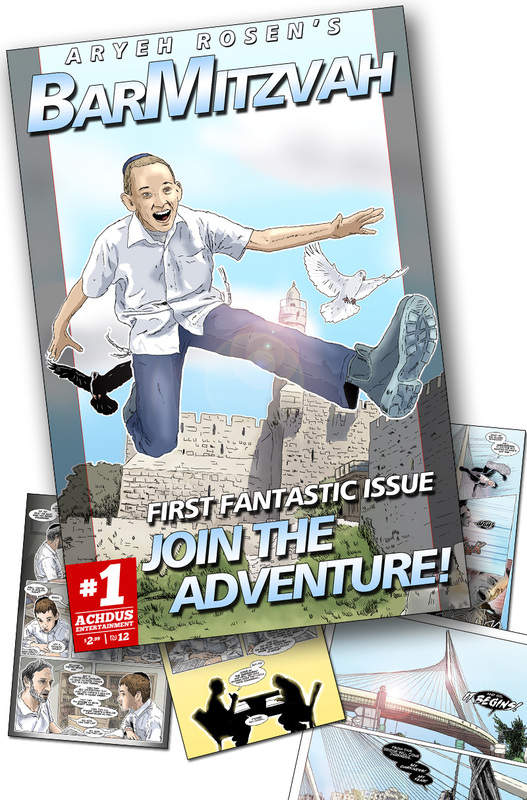 What better way for your Bar/Bat Mitzvah to truly stand out and be unique – but to have your own comic book cover starring your own child. Or, it can be a gift for the child within all of us. The commission I’m working on currently is a gift for a man who teaches bar mitzvah parshas – and a life long comics nerd! We all know a few uber geeks in our lives (and HEY, I’m one!) who would just love this. This is a very specialized style of art, and is priced at $500 for a full colour cover, with up to three people in it. If you really want to do something special, you can have a 4 page mini adventure story made in addition, featuring the subject of the cover, and their family and friends. (printing is $2.35 per copy, or $662 for 500 or $669 for 750, with the price dropping per copy for the greater number ordered.